Summarized below are various arts-related events, starting with the first on the fall calendar. Links are provided to the related websites. UC Berkeley’s Music Department, ranked for decades among the top three music departments in the United States, launches it 58th year of free concerts for the community. The first concert starts at 12:15 p.m. on Wednesday, Sept. 1, at the Hertz Concert Hall. Details about the noon programs, to be held Wednesdays and Fridays, will be available at the Music Department website. This fall’s guest poets will include Juliana Spahr (Thursday, Oct. 7), a poet, editor, literary critic and associate professor of English at Mills College in Oakland, whose 2005 volume of poems, “This Connection of Everyone with Lungs,” chronicled the buildup to the latest U.S. invasion of Iraq; and Indigo Moor (Thursday, Nov. 4), author of “Tap Root” and “Through the Stonecutter’s Window;” and Hass’s fellow former U.S. poet laureate Kay Ryan (Thursday, Dec. 2). For the complete lineup for the year, see the Lunch Poems website. One Thursday each month, literary aficionados gather at the Morrison Library within Doe Library for “Story Hour in the Library” to hear riveting, contemporary authors read from their works. All events run from 5-6 p.m.
Aurthor Laurie King and graphic novelist Gene Luen Yan will read in the fall "Story Hour" reading series. This year’s series begins on Thursday, Sept. 9, with a reading by Rabih Alameddine, a resident of San Francisco and Turkey and the author of “Koolaids,” “I, the Divine,” “The Perv,” and most recently, “The Hakawait,” which is Arabic for storyteller. David Sheff, named one of the world’s most influential people by Time magazine in 2009, will be on hand on Thursday, Oct. 14, to discuss his personal story, “Beautiful Boy: A Father’s Journey Through His Son’s Addiction,” which won the 2009 Barnes and Noble Discover Award. The Marin County author is a noted writer for The New York Times, Wired and other publications. Laurie R. King, an award-winning mystery author of a popular, historical series about Sherlock Holmes and a fictional sidekick sleuth, Mary Russell, will talk on Thursday, Nov. 4, about her latest book in that lineup, “The God of the Hive” (2010). 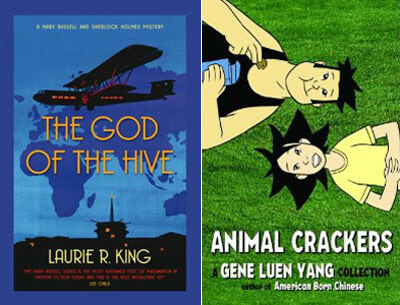 Gene Yang wrote the award-winning “American Born Chinese,” the first graphic novel nominated for a National Book Award, and this year has two new graphic novels, “Prime Baby” and “Animal Crackers,” on bookstore shelves. Yang will talk on Thursday, Dec. 2. See the Story Hour at the Library website for details. “Knowledge Hacking,” an exhibit opening Wednesday, Sept. 15, at UC Berkeley’s Worth Ryder Gallery in Kroeber Hall, will feature three collaborations between scientists and artists that aim to promote better public understanding and engagement. 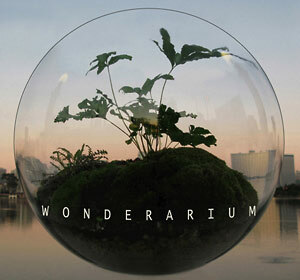 This acyrlic floating terrarium, called the "Wonderarium," will be launched on Oakland's Lake Merritt. • “Wonderarium,” an acrylic floating terrarium measuring 8-feet in circumference is planned for a launch on Oakland’s Lake Merritt in 2012, and will be illuminated at night by solar-powered LED lights. The Worth Ryder Gallery will display a terrarium prototype assembled by Oakland artists Yvette Molina and Sarah Filley. Christopher Carmichael, associate director of collections and horticulture at the UC Botanical Garden, is advising the artists on plant selection for the “punishing conditions” the terrarium will face on Lake Merritt. • “Energy Harvesting as Public Art,” will enable visitors to experiment with modular, wearable, energy-harvesting technology components that tap into ambient sources to produce electricity. Stephen Wilson, professor at San Francisco State University’s Conceptual and Information Arts Program, is working with Liwei Lin, UC Berkeley mechanical engineering professor, on this project. The project relates to Lin’s nanofiber research that may lead to clothes and textiles that generate and store energy. • “Limbique” is a project aimed at developing a 3-D visualization of cognitive activity. It is the brainchild of UCLA artist Pinar Yoldas and Duke University psychology and neuroscience graduate student David J. Paulsen. The Worth Ryder Gallery exhibit will host a reception from 4-7 p.m., Wednesday, Sept. 15, with the collaborators, who will return for a panel discussion of their work from 2-3 p.m., Friday, Sept. 24. For details, see the Department of Art Practice site. When is a cupcake more than a cupcake? Is it an icon of luxury and obesity, a source of harmless pleasure, or a point of connection for non-competitive socialization? Students, professional designers and professors of design will gather at 7 p.m., Tuesday, Sept. 21, in Room 220 (the Geballe Room) of Stephens Hall for “Design: Problem or Solution,” a discussion about the values and costs of design, using the cupcake as a focal point. The program is sponsored by UC Berkeley’s Townsend Center for the Humanities. More information about Townsend Center programs is available on its website. Cal Performances is pulling out the stops with a series of 14 free, 45-minute programs at venues across the campus to share the arts with the community and provide a sampling of its 2010-2011 lineup. The performances are from 11 a.m. to 6 p.m. on Sunday, Sept. 26. Musical offerings will range from the Kronos Quartet, John Santos Sextet, San Francisco Opera Adler Fellows, Diamano Coura West African Dance and Music to the Cal Band. 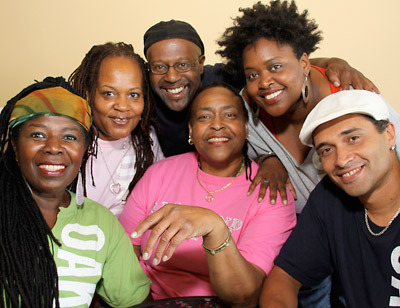 Audiences will be invited to join a community sing-along and learn Gullah “stick pounding,” an African tradition from the coastal regions of Georgia and South Carolina, as well as Linda Tillery and the Cultural Heritage Choir. More information about “Fall Free for All” events is online. Artist Mark Tribe will focus on art, technology and politics — in the forms of protest, camera phones and YouTube — in a free, public lecture hosted by the Center for New Media about “Mediation, Performance and the Public Sphere,” from 7:30-9 p.m., Monday, Oct. 11. It will take place at Sutardja Dai Hall’s Banatao Auditorium. From 4-7 p.m., also on Oct. 11, expatriate Iraqi filmmaker Maysoon Pachachi will discuss how some foreign media outlets “give Iraqis a voice,” as well as her approach to documenting daily life in Iraq since 2003 in her film, “Open Shutters Iraq.” She will be joined by Susana Ruiz, a Southern California doctoral student who produced the documentary, “Darfur is Dying,” and who explores multimedia games for art and social justice. The event will take place in the New Media Commons, Room 340 of the Moffitt Library. • Downloadable images of the listed events can be found at the NewsCenter download page. • Audio of Indigo Moor’s reading of “Back Through the Storm Door”. • Audio of “The Edges of Time” by poet Kay Ryan.